Bacheri village has decided to boycott the elections. HOURS BEFORE Prime Minister Narendra Modi addresses a rally at Akluj town in Madha constituency of Solapur on Wednesday in support of the BJP candidate, the local administration is leaving nothing to chance — it is cleaning roads, removing the garbage, arresting protesting farmers and ordering shops to down shutters while stepping up security arrangements. But barely 20 km from the rally venue, villagers are struggling to latch on to every drop of water that comes their way. Thirty-eight villages, with a collective population of over 50,000, are currently getting water either after three to four days or even after 15 days at some places. Among these, 22 depend on water from Nira Right Bank Canal, which flows from Vir dam. However, the canal has remained dry despite the irrigation department releasing water on March 10. The remaining 16 depend on tanker water for the better part of the year. If the tankers fail to turn up, villagers have no option but to cycle their way or walk for four km in search of water. One of these 16 villages, Bacheri has decided to boycott the elections. On Tuesday afternoon, when The Indian Express team reached Bacheri, villagers were seen making a dash for a water tanker that had just arrived. Sarpanch Kusum Mane (60) said: “The tanker arrives sometimes after four to five days, but many times, after 10 to 15 days. They send us water tanker when they feel like… We know the PM is coming tomorrow. We hope he finds time to see our plight.” Mane added that last week, 100 villagers attended a gram sabha meeting and unanimously decided to boycott the elections. The scene in Shingorni, among the 22 villages that draw water from the canal, is no different. “The canal is far away from our villages. The plan for a new canal has remained on paper. 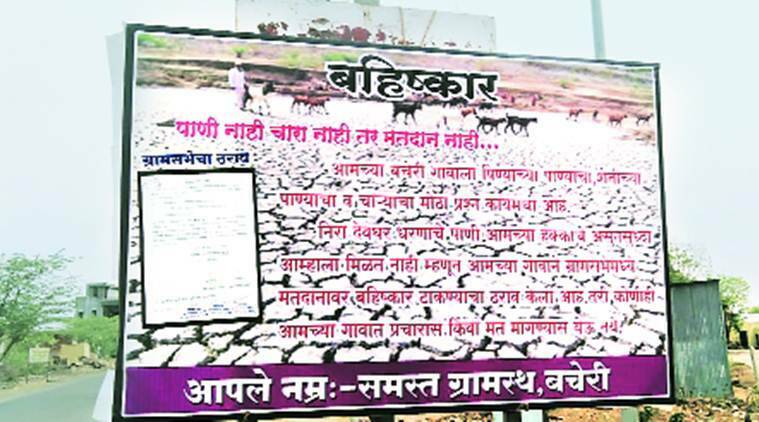 A survey was carried out in 1998 for supplying water from Rajewadi lake, that too has remained a non-starter,” said Sameer Sathe, a veterinary doctor from Shingorni. Villagers alleged that they have become victims of water politics. “The canal passes through 22 villages, but has been dry for months. This, despite water being released from Vir dam on March 10. This means that on way to the villages, the water gets stolen and diverted,” said Vinayak Gurav, a farmer. While BJP leaders refused to comment, Congress-NCP candidate Sanjay Shinde said if he is elected, he would accord top priority to resolving the water problem. “There is anger among voters against sitting MP Vijaysinh Mohite-Patil in Madha in Solapur district. This is why NCP and then BJP denied him a ticket. Water is a major issue in the taluka and it will decide the fate of the candidates,” said Congress taluka chief Nagesh Kakade. Meanwhile, farmers belonging to Baliraja Shetkari Sanghatana have decided to show black flags to the PM when he arrives in Akluj to address a rally in support of Ranjit Naik Nimbalkar. Sanjay Patil, who heads the outfit, said: “The PM had promised complete loan waiver and minimum support price of one-and-a-half times the production cost of crops. But he has done nothing.” While Madha is set to vote on April 23, neighbouring Solapur constituency will vote on Thursday.